CoreCommerce Order Fetch App confirms the order details fetching from CoreCommerce Account on the ticket for the proper validation and avoid bogus queries. Now, you can provide close attention to each and every customer’s query coming from your CoreCommerce Store and resolve their issue in the less amount of time. Why do you need CoreCommerce App Integration? The integration of CoreCommerce App is easy and takes less amount of time of the customer to integrate into their UVdesk Account. Streamline the details of any order number of CoreCommerce Store on the ticket system which will improve the support system and efficiency of the ticket. How to get XML key and Connection URL in CoreCommerce? You need to visit the Store API settings under All Settings on your CoreCommerce Admin Dashboard. From there, you can set the XML key and the Connection URL is displayed at the bottom. You can copy both parameters and use while configuring the app on UVdesk. What order details can I see on the ticket system regarding CoreCommerce orders? While entering the store name, do we have to give full URL or only the name of the store? 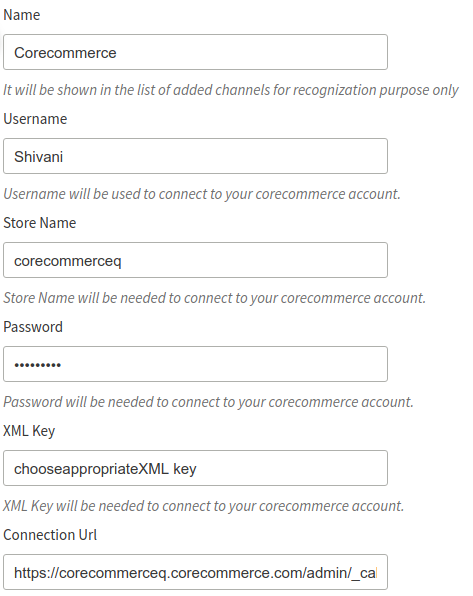 In the store name, you only need to provide the store name that you have provided while registering on CoreCommerce. Make sure that name does not consist of the domain CoreCommerce.